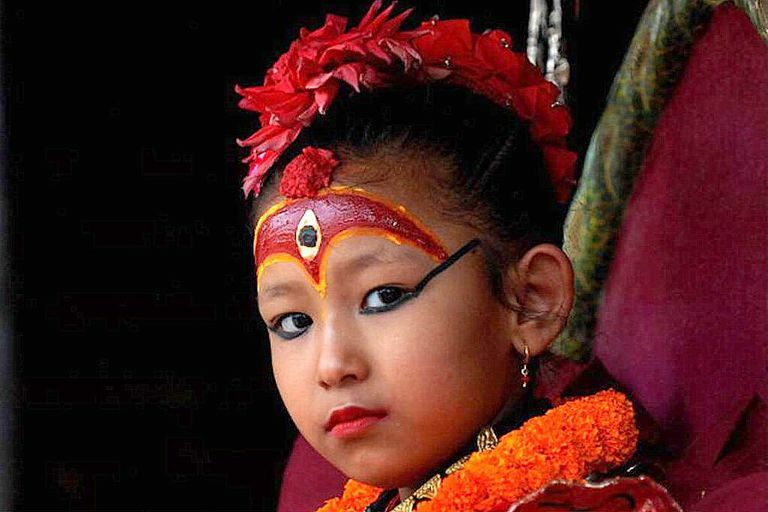 The custom of worshiping a pre-pubescent girl, who is not a born goddess, as the source of ‘Shakti’ or supreme power is an old Hindu-Buddhist tradition that still continues to this day in Nepal. 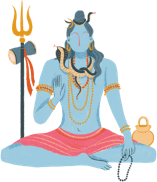 This practice is based on the belief as described in the Hindu scripture of Devi Mahatmya that the supreme Mother Goddess Durga, who is thought to have manifested the entire creation out of her womb, lives in the inner recesses of every woman in this entire cosmos. The selection of the Kumari, who is entitled to sit on the pedestal for worship as the Living Goddess is an elaborate affair. According to the traditions of Vajrayana sect of Mahayana Buddhism, girls in the age-group of 4-7 year, who belong to the Sakya community, and have an appropriate horoscope are screened on the basis of their 32 attributes of perfection, including the color of eyes, the shape of teeth and even voice quality. They are then are taken to meet the deities in a dark room, where terrifying tantric rituals are performed. The real goddess is one who stays calm and collected throughout these trials. Other Hindu-Buddhist rituals that follow, finally determine the real goddess or Kumari. After the ceremonies, the spirit of the goddess is said to enter her body. She takes on the clothing and jewelry of her predecessor and is given the title of Kumari Devi, who is worshiped on all religious occasions. She would now live in a place called Kumari Ghar, at Kathmandu’s Hanumandhoka palace square. It is a beautifully decorated house where the living goddess performs her daily rituals. Kumari Devi is not only regarded a goddess by the Hindus at large but also by Buddhists from Nepali and Tibet. She is considered an avatar of the Goddess Vajradevi to the Buddhist and the Goddess Taleju or Durga to the Hindus. The Kumari’s godhood comes to an end with her first menstruation, because it is believed that on reaching puberty the Kumari turns human. Even while enjoying her goddess status, the Kumari has to lead a very careful life, for a little bad luck can instantly turn her back into a mortal. So, even a minor cut or bleeding can render her invalid for worship, and the search for the new goddess has to begin. After she reaches puberty and ceases to be a goddess, she is allowed to marry despite superstitions that men who marry Kumaris die a premature death. During the Kumari Puja festival in September-October every year, the living goddess in all her bejeweled splendor is borne in a palanquin in a religious procession through parts of the Nepalese Capital. The Sweta Machhendranath Snan bathing festival in January, the Ghode Jatra festival in March / April, the Rato Machhendranath chariot festival in June, and the Indra Jatra and the Dasain or Durga Puja festivals in September / October are some of the other occasions on which you can see the Kumari Devi. These grand carnivals are attended by people in thousands, who come to see the living goddess and seek her blessings. In keeping with an old tradition, the Kumari also blesses the King of Nepal during this festival. In India, Kumari Puja mostly coincides with Durga Puja, usually on the eighth day of Navaratri. In 2015, there were 10 Kumaris in Nepal with 9 residing in the Kathmandu Valley alone, which bore the brunt of the devastating earthquake that left thousands dead, injured and homeless. Surprisingly, all Kumaris survived and their 18-century residence of Kathmandu was left completely unaffected by the great quake.